Insects have maintained a parallel immune response to the innate immune response of vertebrates, despite their divergence approximately 500 million years ago. The preservation of this immune response highlights its success and efficacy in combating microbial infection (Kavanagh & Reeves, 2004; Salzet, 2001; Leclerc & Reichhart, 2004; Kanost et al., 2004). 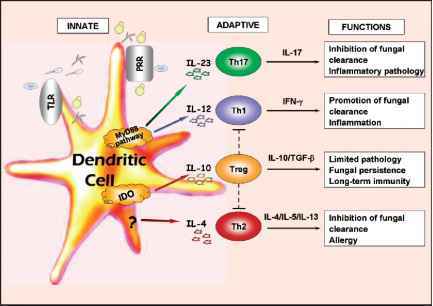 It was initially thought that the innate immune response was inferior to the adaptive immune response, as the adaptive immune system has the ability to 'remember' pathogenic encounters. 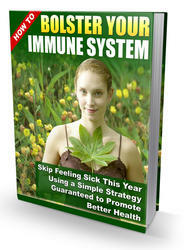 However, it is now generally agreed that the innate immune response is a very important arm of the immune system, being the first line of defence encountered by invading microbes. The importance of the innate immune response in fighting infection has been highlighted by disorders in which aspects of this immune system are not functioning, such as neutropenia and CGD (Segal, 1996; Meyer & Atkinson, 1983; Gerson & Talbot, 1984; Latge, 1999). Insects rely exclusively on an innate immune response, and because of this, can be employed to investigate the innate immune response of vertebrates to many pathogenic micro-organisms without the difficulty of having to separate out the adaptive immune responses as would occur in mammals (Figure 3.1). Many parallels exist between the immune response of insects and the innate immune response of vertebrates, including similar coagulation processes (Theopold et al., 2002), phagocytosis (Costa et al., 2005; Tojo et al., 2000), superoxide production (Imamura et al., 2002; Adema et al., 1994) and AMP production pathways (De Gregorio et al., 2002). Insects also have a blood equivalent, a fat body that is an analogous tissue to vertebrate liver, immune cell equivalents (Tojo et al., 2000), immunological receptors (Cherry et al., 2006; Pandey et al., 2006; Yoshida et al., 1986; Duvic & Soderhall, 1992) and AMPs comparable to vertebrate immuno-related proteins (Cociancich et al., 1993; Johns et al., 2001; Thompson et al., 2003; Yu et al., 2002). 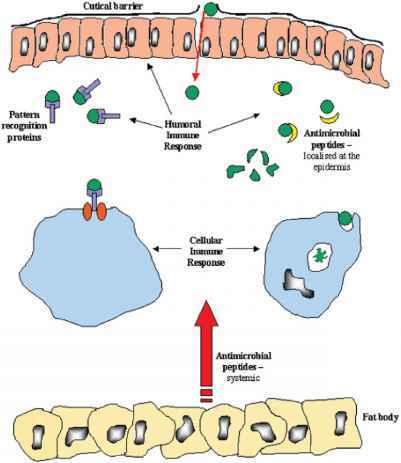 The insect immune system consists of cellular and humoral responses. The cellular responses are mediated by haemocytes, which are found in the insect haemolymph and operate by engulfing or binding to foreign cells that entry through the cuticle. Haemocytes are structurally and functionally analogous to human neutrophils. The Humoral elements include the ability to produce antimicrobial peptides to combat a pathogen and to produce melanin (melanisation) which acts to immobilise and/or kill the pathogen.